Decorative Dividers by LTL Home Products, Inc.
Our solid white pine dividers – with a traditional, curved-frame top or modern, clean lines adds flair and privacy to work, play, or office areas. 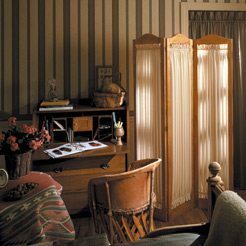 Paint, stain, or customize dividers according to your imagination, and get creative with your own fabrics and finishes! A basic unit consists of three 16″ – wide hinged panels.